Background: Sodium glucose co-transport 2 inhibitors (SGLT2-i) are the new class of antidiabetic medications which are recently approved (2013) by the Food and Drug Administration (FDA) for the treatment of diabetes. These inhibitors block the SGLT2 protein which involved glucose reabsorption from proximal renal tubule resulting in increased glucose excretion and lower blood glucose levels. These inhibitors exert favourable effects beyond glucose control such as consistent body weight, blood pressure and serum uric acid reductions. Canagliflozin, Dapagliflozin and empagliflozin belong to the class of SGLT2 inhibitors. Results and Conclusion: All these drugs are giving promising results in the treatment of diabetes mellitus, but emerging data from post-marketing studies indicate their adverse effects such as diabetic ketoacidosis, genital and urinary tract infection, cancer, bone fracture and foot and leg amputation. Thus, there is a need for better understanding the risk profile of SGLT2 inhibitors. 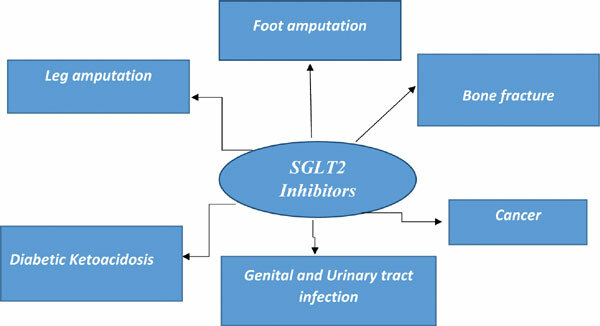 In this review, we have compiled the risk profile of SGLT2 inhibitors by collecting information from various sources such as case reports, published literature and from various regulatory websites. Further, the proposed mechanism of risks has also been discussed. Keywords: Gliflozin, SGLT2 inhibitor, adverse drug reactions, diabetes mellitus, canagliflozin, empagliflozin. Keywords:Gliflozin, SGLT2 inhibitor, adverse drug reactions, diabetes mellitus, canagliflozin, empagliflozin. Abstract:Background: Sodium glucose co-transport 2 inhibitors (SGLT2-i) are the new class of antidiabetic medications which are recently approved (2013) by the Food and Drug Administration (FDA) for the treatment of diabetes. These inhibitors block the SGLT2 protein which involved glucose reabsorption from proximal renal tubule resulting in increased glucose excretion and lower blood glucose levels. These inhibitors exert favourable effects beyond glucose control such as consistent body weight, blood pressure and serum uric acid reductions. Canagliflozin, Dapagliflozin and empagliflozin belong to the class of SGLT2 inhibitors. Diabetes Mellitus-Cell Transplantation and Gene Therapy Approaches. Spoligotyping for Identification of Pulmonary Tuberculosis with Type 2 Diabetes Mellitus Profiles in Warangal, T.S.